So I begin this year’s A-Z challenge. One letter each day and on the theme of Great Houses of Britain. Today it’s A for Athelhampton House (Dorchester, Dorset), which I visited a several years ago and has a link to a family member. More on that in a bit. The great hall was built in 1485 by Sir William Martyn. The great part just means big as many hall houses were simply that – a large chamber where the family ate and relaxed by a big fire. With the family seated perhaps on a dais, a minstrels gallery for entertainment and the kitchen tucked away out of sight behind a screen, life revolved around this multifunctional room. Servants slept there at night on the rushes and the dogs picked up the scraps. Originally in earlier manifestations of the great hall, a large central fireplace needed vents to extract the smoke – chimneys came later. By the 15th century, the great hall was in decline. More private chambers were added to houses, and other functional rooms such as a library and dining room, guest and servant quarters. The hall became a showroom for greeting newly arrived guests and big banquets on grand occasions, but otherwise it ceased to be the heart of the house. This is what happened at Athelhampton – it doesn’t look very medieval these days. Constantly restored and enlarged, by the time Alfred Cart de Lafontaine bought the house in 1891 it was a truly Victorian house with walled gardens and topiary yew trees. As well as Russian Artist Marvena, author Thomas Hardy was a regular visitor in the 20th Century. Now this is where my little titbit of family history drops in. My grandmother worked at Athelhampton as a maid. During one visit by Thomas Hardy, she waited on him as he ate dinner. He dropped a sausage on the floor and my grandmother kicked it under the table for him. It seems that was the polite thing to do – ignore it and hide the evidence of his clumsiness. He was probably quietly appreciative. My grandmother was unfazed by the visit, in fact, she only mentioned meeting Thomas Hardy quite late in her life. Hardy wrote two poems associated with Athelhampton: The Dame of Athelhall and The Children and Sir Nameless, which is suppose to related to the Martyn tombs in the local church. What else is Athelhampton famous for – ghosts? Supposedly one of the most haunted houses in England with seven of them. The list includes Civil War soldiers duelling, a monk or priest from the days of Catholic persecution and a cooper tapping in the wine cellar. Best of all, an ape! The pet was accidently entombed in a secret passage where he scratches the panels to make himself heard. My grandmother never mentioned any of these things; just a sausage on the floor. Your grandmother met Thomas Hardy!! How spectacular is that?! A fab start to the challenge. Happy A-Zing! She was very laid back about it! Brilliant! Do you know what? I lived in Dorchester from 9-18 and NEVER VISITED! Although we did go every year to look at the snowdrops in the garden, in the spring; glorious. My ancestors on my mum’s side are Dorset and my grandfather, too, saw Thomas Hardy. No sausage involved – that’s quite a story! Liz http://www.poetryroundabout.com – an A-Z of best children’s poets, with their poems. I’m still a Dorchester girl at heart! Funny how we never visit what is on our doorstep. My grandmother lived most of her life in Norfolk. It might have been the highlight of his visit! She probably worried that the sausage might roll too far! Even the title had me chuckling! Great start to the challenge. Thank you. Athelhampton is a great letter to start the challenge. It’s going to be a real mix bag. I’m still working on the posts! I didn’t know about the ghosts until I read up on the house. What a great theme! (No pun intended). I always wondered how people stayed warm in those large halls, even with the fireplace… Also, I am not really into ghost stories, but animal ghosts fascinate me. The largest great hall would have more than one fire, but can you imagine the smoke and smell! Animal ghosts are unusual, so an interesting addition to the house. What a massive house. I always wonder how they keep it warm. HVAC–I don’t think so! It’s not as grand as many of the aristocratic stately homes, but up and down the country there are houses like this tucked out of sight and privately own. Great halls, the original ‘open concept’ floor plan. Grandma must have been a dog’s best friend. Terrific post to kick off the challenge. I’ll check in tomorrow! She probably was followed around by the dogs all day! Thanks for stopping by. What a fun topic. I look forward to the whole A to Z! Thank you, they’re going to be a mixed bag of posts! Who knows. But I’m sure my grandmother would have mentioned them. Haven’t never met a ghost, I don’t know about the bothersome, entertaining would be more interesting. Lovely start to AtoZ with great details to make the house come alive. Can’t wait to see more! Thomas Hardy and ghosts in a gorgeous historical Manor. What else could we ask? Seems almost too good to be true! I’m a little envious of my grandmother, although I expect she worked very hard as a servant. What an opening post! It had a little of everything. I’m sad for the lost sausage, having lost one in the past to an industrious cavalier king charles spaniel! 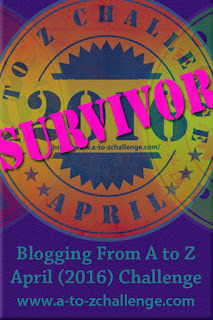 Glad I found you through the A to Z Challenge! Thanks for finding me. Yes, the poor sausage had an indignant end.